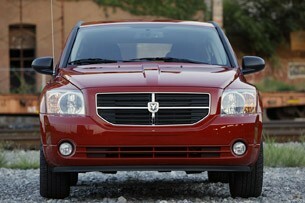 We didn't exactly get off on the right foot with the Dodge Caliber. As the spiritual successor to the profitable and successful Dodge Neon, this boxy hatch had big expectations to meet when it touched down way back in 2006. Unfortunately, the Caliber never found itself in the same room as those expectations. But it was crafted during the dark days before Chrysler's fall, and the company has recently made great strides in shoring up its product line. Nearly every vehicle in the Dodge and Chrysler stable, as well as few pieces from the houses of Ram and Jeep, have gone under the knife and come out all the better, but the lowly Caliber has largely escaped revision. Facing new competition from vehicles like the revised Honda Civic, all-new Hyundai Elantra, Chevrolet Cruze and fresh Ford Focus, the Caliber is awash in a sea of excellent options. We took to the wheel to find out if the compact from Dodge has enough life left to keep its head above water until a replacement arrives. The Caliber hasn't received many updates in the five years it's been on the market, and so it brings a familiar face to the road. The handsome split-crosshair grille of the Durango and Charger hasn't trickled down to this five-door just yet, so buyers are left with the old single-crosshair design backed by a series of stacked vertical slats. Squared-off headlight housings and a bulky lower fascia cap off the nose, while wide fenders and a raised hood transition into the vehicle's flanks. The Caliber has always had an odd stance thanks to its CUV ride height and minivan-inspired roof line. Those traits continue on for 2011, as do a set of exaggerated fender arches. Our Heat tester came equipped with some stylish standard 18-inch alloy wheels, which did much for the overall appearance. Unfortunately, an awkward C-pillar and the plastic roof rails that span the entire length of the cabin don't do the exterior any favors. Around back, the Caliber is a study in hard edges with protruding tail lamp housings, a recessed hatch and a squared rear valance. The view is certainly beginning to show its age. Indoors, the cabin has held up well, mostly because it's newer than the rest of the car. While the dash is all hard plastic, the center stack is trimmed with a bias toward the driver's side and controls for the climate system and stereo are easy to access. On the whole, the package looks nice. Unfortunately, the cubby located just north of the shifter gate isn't as deep or large as we'd like. Storing a phone and a music player or a phone and sunglasses is an exercise in figuring out which accessory gets to ride in the cup holder. The small bin wouldn't confront us so much were it not for the unforgivable center arm rest. While the fact this piece can be adjusted front or back is nice, it's hewn from cheap and flimsy-feeling materials and lacks enough storage capacity to be of any use. With its painfully visible mold seems, we'd prefer the piece to be deleted all together. The good news is that there's room for four adults inside the cabin. 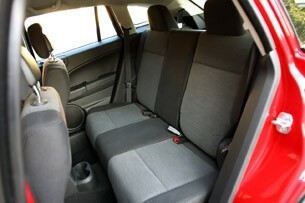 Up front, occupants enjoy up to 41.8 inches of leg room, which is comparable to the 42 inches served up by the 2012 Honda Civic, though falls well short of the 43 inches available in the 2011 Hyundai Elantra. Meanwhile, with 39.8 inches of front headroom, the Caliber beats out the Civic by 0.8 inches and the 2011 Chevrolet Cruze by half an inch. Things get a bit more cramped for rear riders. At 35.7 inches of rear legroom, the Caliber falls to the Civic but eclipses the Elantra by 2.6 inches and the Cruze by .3 inches. Unfortunately, getting out of the Caliber's rear seats requires ducking the roof rails. 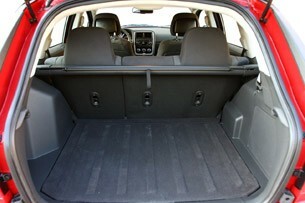 Additionally, the functional hatchback design provides 18.4 cubic feet of cargo area with the seats up. While that handily beats the sedan competition, the five-door 2012 Ford Focus provides an impressive 23.4 cubes behind the second row. Drop the seats in both models, and the Dodge redeems itself with 47.4 cubic feet of space compared to the 44.8 cubic feet in the Ford. Unfortunately, owners are forced to lower the back seats by pulling on a tether at the bottom of the cushion instead of near the headrest, forcing you to walk around the vehicle to lower both seatbacks. Even so, the Caliber remains fairly competitive on its interior numbers, despite serving five long years in the segment. 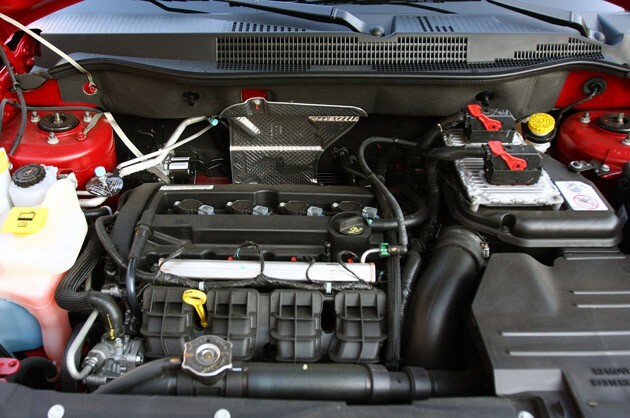 Unfortunately, any competitive edge the vehicle earned indoors evaporates quickly once you take a peek under the hood. 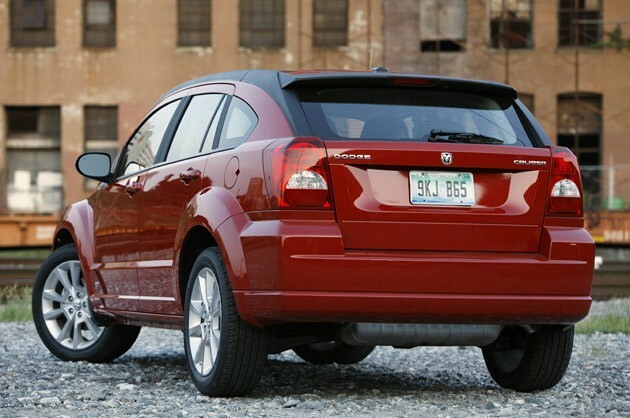 The 2011 Dodge Caliber is technically available with two engines and two transmissions: a 2.0- or 2.4-liter four-cylinder and manual or CVT transmission. Our tester came laden with the less powerful 2.0-liter four-cylinder that produces 158 horsepower at 6,400 rpm and 141 pound-feet of torque at 5,000 rpm. Those power figures turn up fairly high in the rev range given that the engine tops out at 6,750 rpm, and as a result, buyers can expect no more than 23 mpg city and 27 mpg highway. According to the Environmental Protection Agency, those estimates average out to a paltry 24 mpg combined. The CVT is the culprit here, as your efficiency improves to 24 mpg city and 32 mpg highway if you opt for the manual transmission. In contrast, the 2012 Honda Civic delivers 140 horsepower and 128 lb-ft of torque while consuming 28 mpg city and 36 mpg highway in its least efficient form. If you're counting, that's a nine mpg advantage over the Caliber. Things look even worse when the Dodge is pitted against its only other hatchback rival, the Ford Focus five-door. That machine is good for 160 horsepower and 146 lb-ft of torque while sipping along at 26 mpg city and 36 mpg highway. 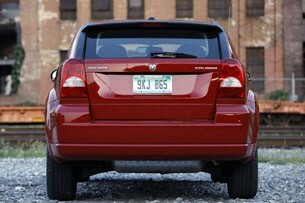 To make matters worse, the 2.0-liter four-cylinder in the Caliber is bolted to a miserable CVT. There are manufacturers who are capable of engineering an engaging continuously variable transmission. Chrysler is not among them. The gearbox results in uncertain and wavering engine speeds as well as a cabin that sounds more than a little like a Cessna in foul weather. Still, 158 horsepower is nothing to sneeze at, or at least it shouldn't be. Unfortunately, the Caliber Heat lugs around 3,012 pounds worth of weight – nearly 400 lbs more than the Civic, 300 more than the Elantra and 100 more than the Focus. As a result, acceleration is more feeble than spritely. Check out the Short Cut below to see what we mean. While achieving highway momentum takes a country mile, once you're at speed, the Caliber is acceptably comfortable. The thick-foam cushions of the front buckets are supportive and adjustable enough, even though the high seating position made us feel like we were riding on a milk crate. Back seat passengers are treated to reclining backs – a nice touch in this segment. Plenty of engine and road noise makes its way indoors, though wind noise is fairly scant. Thanks to a ride height that results in 7.67 inches of ground clearance, there's plenty of body roll should you grow a wild hair and start attacking apexes. For comparison, the Jeep Liberty only offers 7.8 inches of ground clearance at its front axle. This machine is needlessly high off of the ground. The brakes on the Caliber Heat leave little to be desired, however. With 11.5 inch ventilated discs up front and 10.3-inch solid discs out back mashed by single-piston calipers, the vehicle has no problem shrugging speed, though we would appreciate a slightly firmer pedal feel. If you're still with us, you may have noticed that with the exception of its drivetrain, the Caliber is a fairly competitive vehicle. In fact, we could even tolerate its Lego-block styling and unacceptable fuel economy if the vehicle carried a low enough price tag. Our tester did not. With a manufacturer's suggested retail price of $21,105 including a $750 destination charge, you would have to be a few strokes short of a four-cycle to park this in your driveway. At that price, any of the Caliber's competitors would be exceedingly superior choices, even in base trim. If you had your heart set on shelling out over $21,000, you could easily lay claim to a smartly-equipped Hyundai Sonata with a base price of $19,695, a Kia Optima at $19,200 or a Volkswagen Passat at $19,995. All of those vehicles are not only larger, more comfortable to drive and more stylish, but they're also more fuel efficient. The Caliber may have never been on the top of compact buyers' shopping lists, but the last five years haven't been even less kind to the vehicle. While its engine, transmission and exterior styling have all grown to show their age, the competition has risen to fighting form. With a new driveline, a little attention to the interior, a lower ride height and a more palatable MSRP, the Caliber could easily carve out a niche for itself in the compact food chain. Until a replacement arrives from Fiat, the Mopar hatch is just chum in the water. Tags : 2011 Dodge Caliber Heat Photo, Pricing, 2011 Dodge Caliber Heat Review, 2011 Dodge Caliber Heat Classified, 2011 Dodge Caliber Heat Rebate, 2011 Dodge Caliber Heat Spec, 2011 Dodge Caliber Heat Comparison, 2011 Dodge Caliber Heat Warranty, 2011 Dodge Caliber Heat Crash Test Video, 2011 Dodge Caliber Heat Paint Color, 2011 Dodge Caliber Heat Standard Equipment, 2011 Dodge Caliber Heat Recall, 2011 Dodge Caliber Heat Safety Feature, 2011 Dodge Caliber Heat Package/Option, 2011 Dodge Caliber Heat Ownership Cost, 2011 Dodge Caliber Heat Lease Calculator Loan, Alphard Calculator Resale Value, 2011 Dodge Caliber Heat Trade-In Value, 2011 Dodge Caliber Heat Future & Concept, 2011 Dodge Caliber Heat Factory Pics, 2011 Dodge Caliber Heat Factory Videos, 2011 Dodge Caliber Heat Owner, 2011 Dodge Caliber Heat in America, Alphard in USA, 2011 Dodge Caliber Heat is Pakistan, 2011 Dodge Caliber Heat in Italy, Alphard countach, 2011 Dodge Caliber Heat kit cars for sale, 2011 Dodge Caliber Heat kit cars, Alphard carolinas, Alphard wallpapers, 2010 2011 Dodge Caliber Heat , 2011 Dodge Caliber Heat watches, 2011 Dodge Caliber Heat limo, transporter 2 Alphard , 2011 Dodge Caliber Heat logo, 2011 Dodge Caliber Heat watches, 2011 Dodge Caliber Heat wallpaper, 2011 Dodge Caliber Heat racers, 2011 Dodge Caliber Heat black, 2011 Dodge Caliber Heat watch, 2011 Dodge Caliber Heat or sale, 2011 Dodge Caliber Heat for sale, 2011 Dodge Caliber Heat wallpaper.